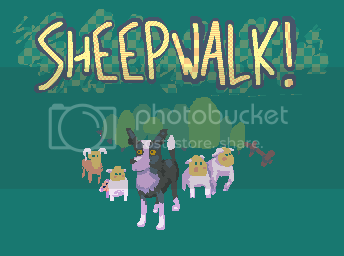 Decided I should do a little splash-screen for my game. Just blocking things out for now. How does it look compisition-wise? Re: A title screen. With sheep. And a dog. It looks like it's all leaning to the left to me. Try turning it upside down and getting things positioned where you like it. Looking nice I really like the masked patterns, the palette & also general stylistic direction. My first thought is why not scale some things up a bit? there's quite a lot of blank space. It's also quite centralised, you could try playing about with offsetting the main elements if you stuck them on separate layers. 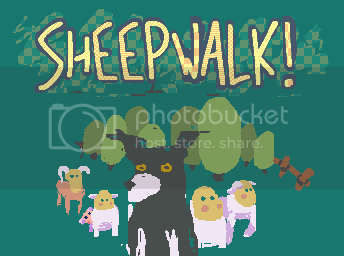 Lastly, the two antagonists are on the same side; I'd put the wolf (lawful evil) next to the regular, defenceless sheep and the ram (chaotic neutral) apart . I feel like a lot of negative space fits with the graphical motif in the game... Simple, minimalist menus and the same green background everywhere. Yeah, I see what you mean. I'll try to balance it a little better. I'd put the wolf (lawful evil) next to the regular, defenceless sheep and the ram (chaotic neutral) apart . Switched some things around, made the dog's head smaller, added some detail. 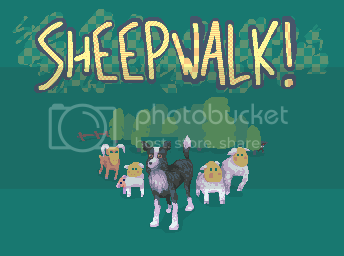 ...Do these dogs look like they're from the same game? What was that I said about "graphical motif"? Alright, If you're not already I would definitely work on the same canvas and possibly utilise a global palette to help with consistency. I've blocked out how you could transfer the more realistic dog taken from the card you posted before into the other situations. scaled up the regal dog and had him pose more self-consciously/proudly. tongues out all over the place, I almost did it with the kingly dog too . The title layout does look kind of dwarfed to me but if the group was weighted more to one side I think it would look a whole lot better. Wow, thanks for the edits. They're giving me some good ideas. No problem, let the ideas flow . I did get that impression, I feel a little responsible for having advised a more realistic direction on the previous portrait card. I think a collage representative of all game elements, in context, would help with figuring out where and how to unify things. My personal bias is obvious here; towards more rendering. I do like sketchy, minimalist stuff but elements such as the farmer's portrait and bits of the original game don't appear to me intentionally loose so much as a bit lazy, almost place-holder. If you're not taking care of things on the pixel level it would look better for being executed in an alternative medium. I like the portrait too, but I feel like it's unfinished; why not refine it and see how it looks? There'll doubtless be many small things that could improve the look of the whole considerably when you look for them, I'd also throw some rough colour on him for comparison. You'll likely have to kill some of your darlings here but it'll be in the service of a better game. Agreed. I'm glad I tried the more realistic rendering, just for learning purposes, but I don't think it fits the game. Painted over the card from my old thread to try out a more sketchy style, with more more vibrant colors. This might be a way to go. More like a screenprint. 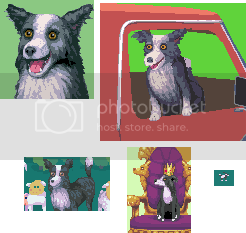 In the game,all the layers scroll, the truck bounces around, and the dog will be animated. For the weirdness of the dog in the truck I can only recommend taking another look at my previous edit; a longer neck and limbs. Beyond the pose it does not much resemble the dog of the portrait. Try and pick a baseline idea of what the dog should look like and then edit/redo things to match. The dog portrait card is currently the odd one out; if you keep drawing a different dog elsewhere then that's what I'd change to match. The Farmer is removed in terms of execution from the 'screenprint' dog because of the random seeming line-work and dithery detail whereas the dog is all blocky shapes, I much prefer the latter approach.